I need to move my 3 litter boxes from the garage to inside the house. I don't have room for 3 boxes, so will likely have to go to one of the 'self-cleaning' boxes. Does anyone have a brand that they like better, or one that I should absolutely avoid? Thanks in advance, and Laurie, I understand if you need to remove this post. 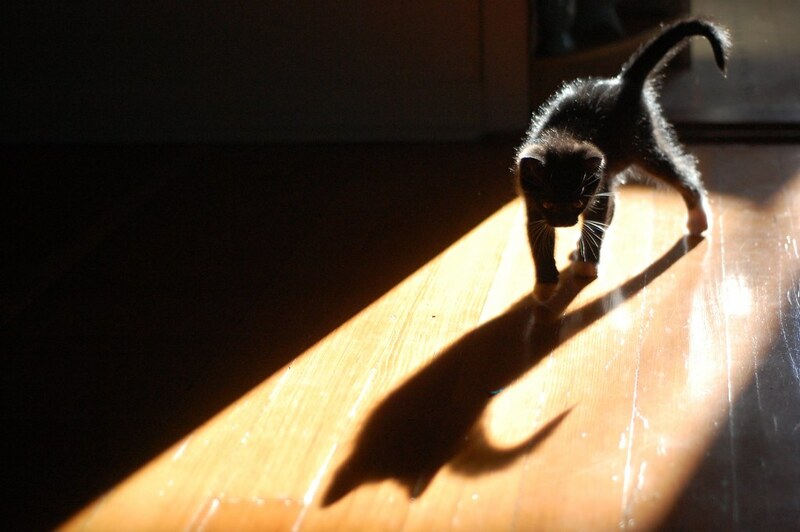 Shadow play! Always a fun sport. Adorable!! those A-E kitties sure know how to have a good time! I have to reiterate a comment I've seen before...how do you ever get anything done with them around the house? Such cuteness and creativity in getting into things! That's wot being a kitten is all abowt ~ having fun! Enjoy! Hee! Those two little flying cat butts and feets just slay me. That last picture is priceless. 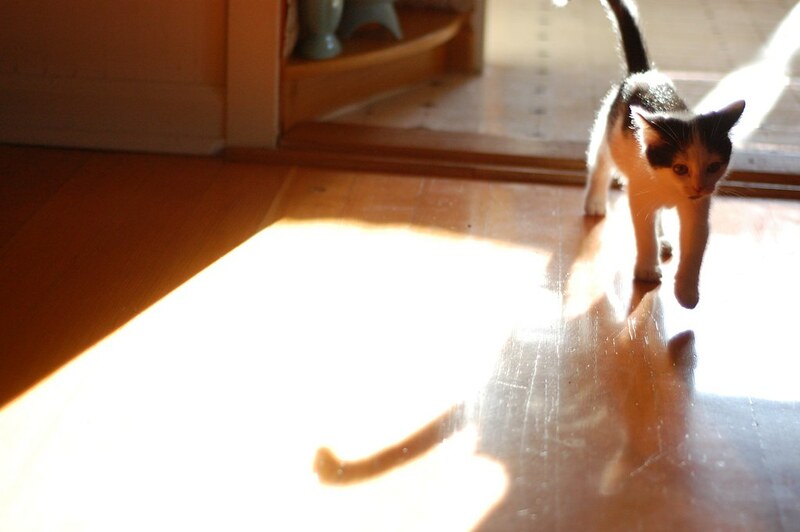 Kittens who hop like bunnies have my eternal adoration. I used a Littermaid and a Cat Genie both, at different times. The Littermaid was great, and I only stopped using it when I moved and it broke. I loved the Cat Genie for a long time. The biggest drawback, for most people, is during the drying cycle, it smells like burning poop. I ended up getting rid of it because one cat was a power shedder, and as the poop broke up, the hair would wrap around the axle of it, and then it would not work, and I'd have to clean it by hand. Another option is what I use now. I have three. I got a large plastic box (like 32 qt, 4 feet long? ), and let them use that. 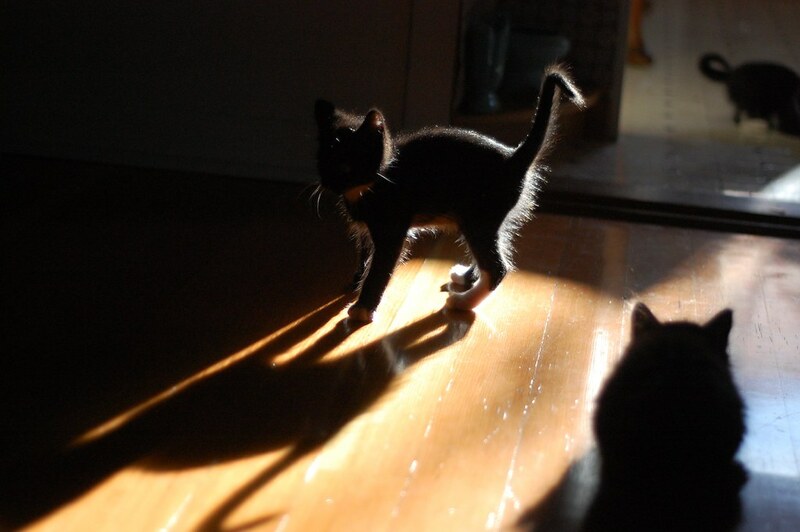 I just LOVE this series of pictures - it looks like the kittens are performing a ballet on stage! Priceless! Anon - Let me cast a vote for Littermaid too - I am on my third over a period of 16 years. Very sturdy. They were the first and IMHO remain the best. My only complaint is scattered litter. 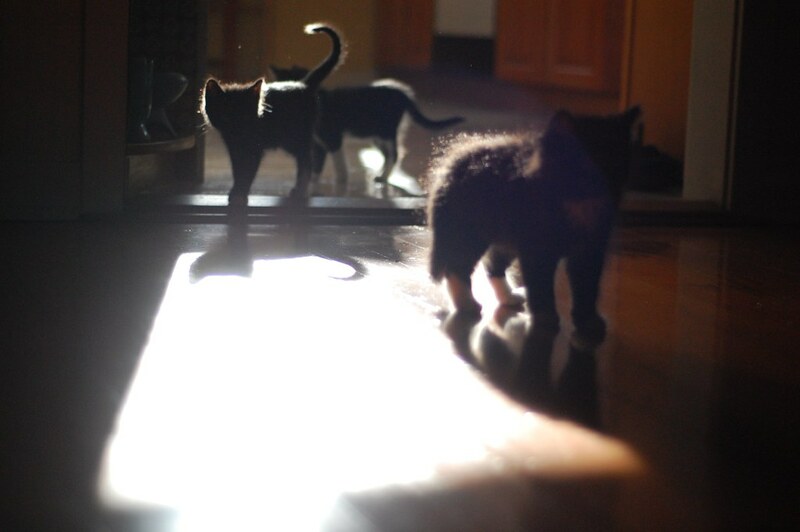 If there is sun spilling anywhere kittens are sure to soak it up! Re the Littermaid, I tried it but it terrified my cats. They would do their business as quickly as possible because they were afraid it would start moving while they were in it ... not good. They would also sit and stare at it, waiting for it to move. 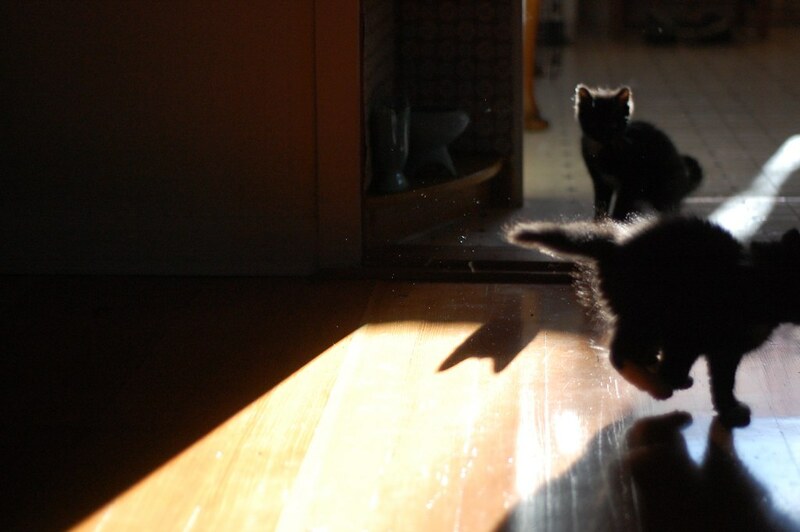 In the first picture I can here the kitten saying, oooh I see a shadow of a kitty..is that another kitten near me? Very cute photos. btw, I use a Littermaid LM920 and it pretty much does the trick. I do have to put plastic under the recepticle area as there is always some litter that escapes as the rakes tips the waste into the recepticle plus my kitties are enthusiastic about burying their waste. i've been very happy with mine though i would suspect you'd want 2 boxes for 3 cats. I think that first picture would make a great Halloween card! I'm loving the shadows of the curly tails! #1 & #5 are both Halloween worthy! The rest are joyous glimpses of kitten joy! And where was Charlene during this romp? Precious bouncing babies, recharging their solar batteries and bringing joy to so many. RE the litter box question. I LOVE my littermaid. We got a modified for it so it sits on a cabinet and scoops itself into a bag. It's very picky about litter though. Must use TidyCats Scoop or it jams. We do have to have a backup box, for which we use the auto scooping crystal throwaway boxes. We don't go through many, but on occasion we've had the box occupied when somebody really had to go. That has led to bad things. So we keep two boxes. The main reason we like the littermaid is that we have a giant 22 pound kitty and he tends to hang over the end of most boxes, causing him to miss. More mess! I have/had a Littermaid and recommend it. It did not scare my kitties at all. Do put plastic or some sort of mat under it to catch the litter that "escapes". I use Fresh Step scoopable and it works well for the Littermaid. Littermaid will actually give you a list of litters that will work well. I found Tidy Cat to be "mucky". Fresh Step is not. Maybe two of these would work well. I have used the Littermaid in the past and liked it OK. However, I now have a boy cat who pees straight out the back, so I could not have anything with no lid. We did as another poster suggested and bought a large plastic tote and cut a hole in the front (you could also cut a hole in the lid for entry if your cats are not as hefty as mine). I have 4 cats and just scoop it every day and it works fine. 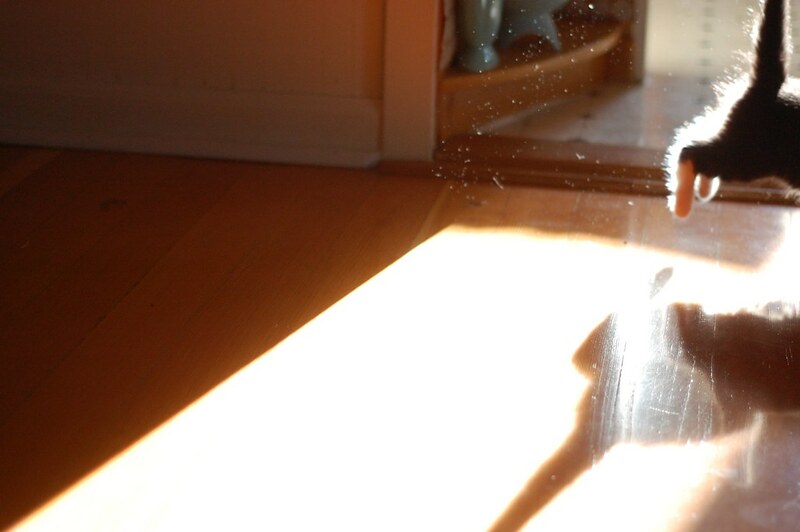 Love how the kitten fuzz looks even fuzzier in the sun beam!!!! Such teensy little tails!!! Me love. Kitten fur-coronas! Love the effect of the light on their silhouettes.